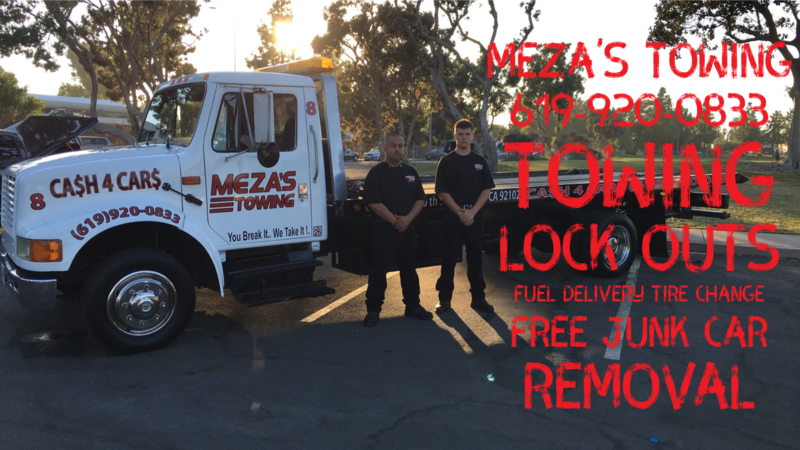 Towing Service Meza's Towing offers affordable towing services. We are experienced to handle all of your towing needs. We offer flat bed towing, lock outs, tire change, fuel delivery and recovery. We also offer Free Junk car Removal. We serve all of San Diego County. Also providing service to all military installations. SERVICES PROVIDED Towing, Lock Outs, Tire Change, Fuel delivery, Recovery, Free Junk Car Removal. We provide service to San Diego County and all Military Installations.